This series narrate my personal experiences of installing Microsoft Dynamics GP 2013 Beta and the Web Client in an unsupported environment. The following installation steps are for testing purposes only and were done on a test box. If you are to test, please make sure your machine is not a production box. After returning from the Microsoft Dynamics GP Technical Airlift 2012, I am more than drinking all this Microsoft Dynamics GP 2013 Web Client Kool-Aid. And why not? After all, this is probably the biggest release to ever hit the block since the days of Microsoft Dynamics GP 6.0 - if you've been around long enough, you will remember that v6 had the first major facelift in the product history. So, I figured the first thing I would be doing is rebuilding my machine with the brand spanking new Microsoft Windows 8 Professional 64-bit operating system, which I downloaded from MSDN. And so I set out to backup all my files onto my home storage area network (SAN), to blow away my current (now former) Windows 7 Ultimate install. Windows 8 is natively equipped with .NET Framework 4.5, ASP.NET 4.5, Internet Explorer 10, Internet Information Services 8.0 (which needs to be added via the Add/Remove Windows Features in the Control Panel). ...in summary, everything not currently supported for the installation of the Web Client. You can read more about the system requirements on Microsoft Dynamics PartnerSource. Nonetheless, off I went to install Microsoft Dynamics GP 2013 and the Web Client. 1. Certificate. Checked! 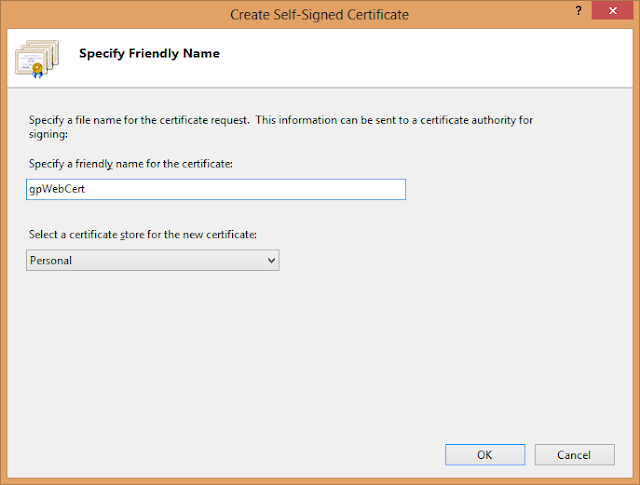 At this stage, I created a self-signed certificate as would normally be accepted (required?) to setup the Web Client in a single machine configuration environment. 2. Required user accounts and user groups. Checked! For this step, I use Computer Management to setup two local users to my machine, GPUser and GPWebAccount. The former is a test user account to access the Web Client, the latter, a test account to access the Web Management Console. NOTE: under the current system requirements, these accounts must be created under Active Directory in a Windows Server 2008 R2 environment, so here's the second difference with the standard pre-requisites. 3. GP Web Client site. Checked! Back in IIS, I created the website as required, prior to begin the Web Client installation. Note that in this step I selected the https binding on port 443 and the physical path, which I created under the inetpub folder. Also, I made sure to select the previously created certificate. 4. ASP.NET. Checked! The beauty of Windows 8 is, it comes preloaded with the .NET Framework 4.5 and .NET Framework 3.5. But this is also an issue at the same time, since you need to install the ASP.NET 4.0 client on the newly created website. 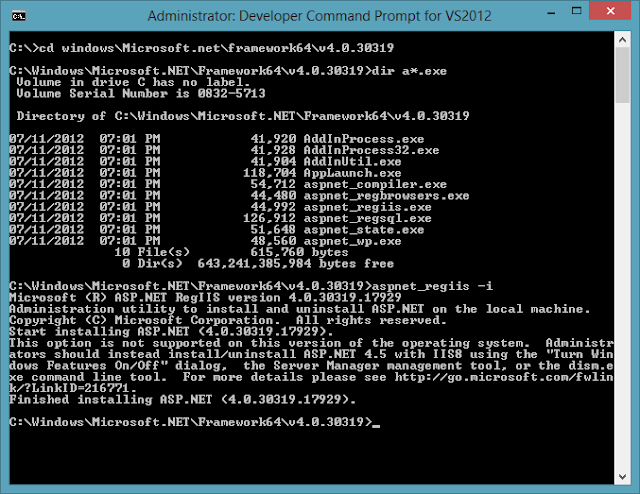 For this I would use the traditional aspnet_regiis command line utility. 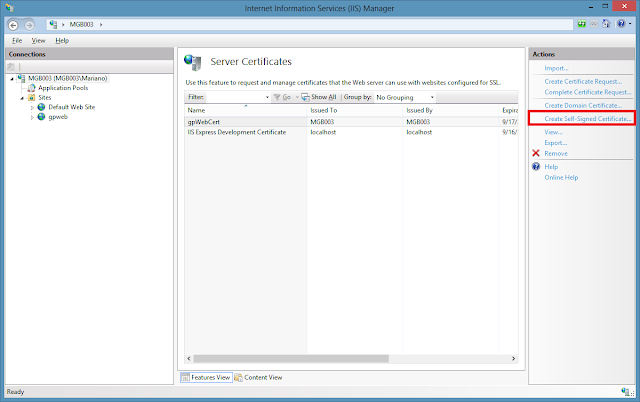 As you can see from the error above, IIS 8.0 is blocking the installation of ASP.NET 4.0 as it is expecting ASP.NET 4.5 to be loaded. NOTE: under the current system requirements, ASP.NET 4.0 and .NET Framework 4.0 are supported. This makes for the third difference with the system recommendations. The URL provided with the error did not provide much assistance. The main question at this point was, if ASP.NET 4.0 cannot be loaded, how would I then load the ASP.NET 4.5 client? After much search, I found a TechNet article describing the steps required to load ASP.NET 4.5 on Windows 8. This article proved to be a live saver, since in Windows 8, the .NET Extensibility 4.5 and ASP.NET 4.5 are considered Application Development Features under IIS 8. Upon following the instructions in the article, I was now able to see the aspnet_client folder under the gpweb virtual directory. Tomorrow, I will describe some of the issues I ran into prior to ironing out the ASP.NET 4.5 client installation on IIS 8.0. Suffice to say, I tried installing the Web Client prior to having ASP.NET installed and that caused some other issues. I am curious about GP2015 Web client and multi-tenant environments. Do you know if I need to have a separate certificate for 2 instances of GP on 2 different app servers? 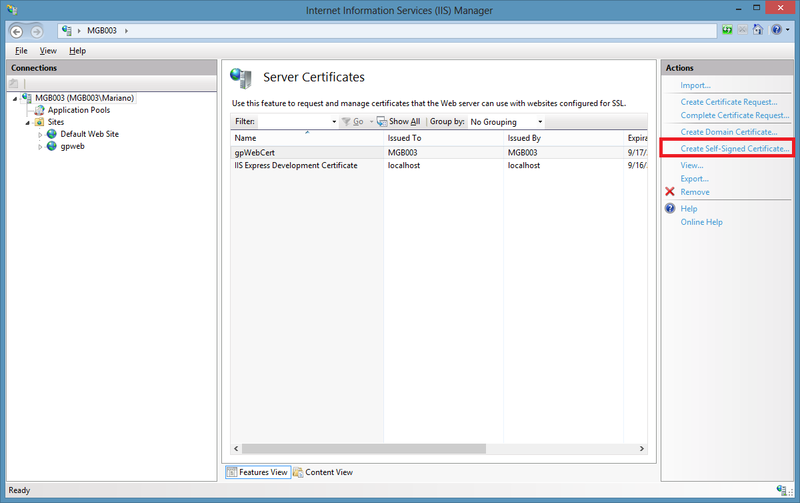 Certificates are installed on the web server, not on the session hosts. 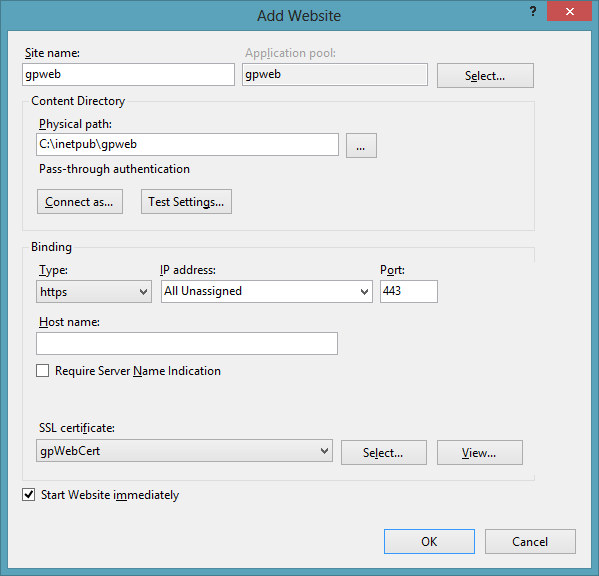 Even if you have an IIS web farm load balancing scenario, you will only need one certificate assuming you are using a central certificate store.